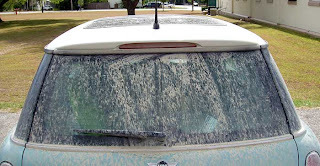 Sick of seeing the boring yet ubiquitous "wash me" on the windows of dirty cars? 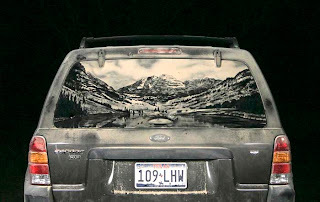 Scott Wade will change how you perceive—and use—that fine layer of dust. 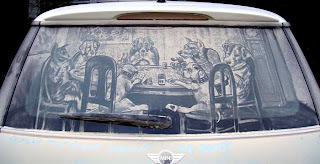 Cars get dirty. It's inevitable—especially if you have to drive a mile and a half on gravel and clay to get to your house each day, as Scott does. 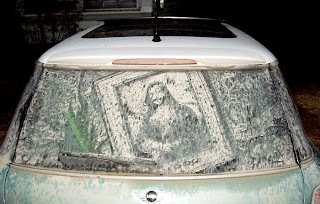 Realizing it was impractical to keep washing his car, he turned the fine dust on the back of his windshield into art. With a strong drawing background, Scott soon began making impressively detailed images on his new-found canvas. 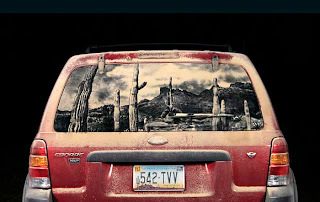 He uses paint brushes and fingers to carefully etch away the dust that accumulates each time he drives home. 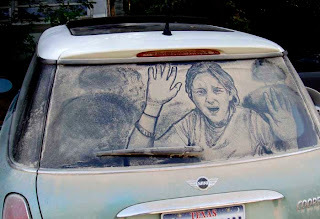 I don't know why, but I've always had this fascination with ephemeral art. Maybe it's knowing that one has to be there to experience it; maybe it reminds me that nothing truly lasts forever. I love seeing art that is made from the elements and art that, in turn, has to deal with the elements. A number of factors—wind, rain, animals, and people—may disturb the final piece, but artists like Scott know how to integrate these disturbances into the artistic process. My friend at Manga Start recently wrote about how fulfilling it can be to draw with everyday items from our own desks. Some of the best art we make are done using tools in our immediate surroundings. They yield unplanned and candid results, and show off our creative process. You don't need an expensive sketching set or gold leaf leather-bound sketchbook to draw. You also shouldn't feel like art has to be confined to sheets of paper or done in a studio. 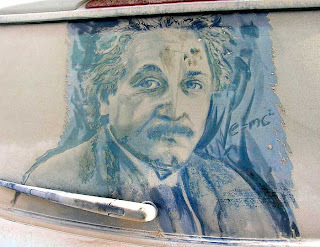 Someone truly innovative can recognize and seize opportunities in his or her environment to generate something creative. Take a quick look around you. Is there anything that can be used to draw or make something? What can you do with the various objects surrounding you? Share your results! I remember reading about something similar in a magazine!